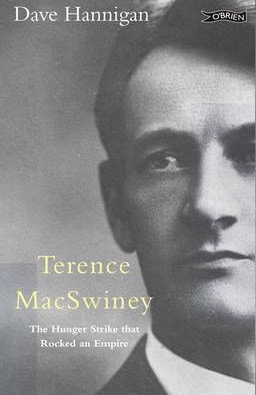 While Dave Hannigan’s book Terence MacSwiney is not a biography per se, it has certain aspects of that genre. Biographies are a difficult genre to write for as the author’s research continues and as he/she gets engrossed in their subject the temptation is to either grow to hate or love the individual they are profiling. This in turn affects their work it often results in books that either damn their subject far too much or to produce a something similar in tone to a medieval saints hagiography. It was almost inevitable that any book dealing with Terence MacSwiney’s actions between August and October 1920 could veer towards the later. MacSwiney himself was an extremely religious man whose hunger strike at the time was widely seen as an act of sacrifice an act of martyrdom. But to give him credit Hannigan does his best not to fall to deeply into that literary trap. But to give him credit Hannigan does his best not to fall too deeply into that literary trap. Hannigan, by choosing to write solely about the hunger strike and the events that transpired worldwide as a result, has written a powerful fast-paced book. This is a story that inspired a tremendous national and international reaction at the time and as you read the book it is easy to understand why. The story of MacSwiney’s final days is an incredibly emotional one. It is impossible to read it and not be moved by his suffering while in prison as well as the pain his loved ones must have felt while watching him slowly fade away. This compressed time frame gives the book the qualities of a novel, it is a real page-turner and the reader will find it hard to put down thanks in no small way to the author’s journalistic style. As the drama unfolds the shadow of MacSwiney’s inevitable demise deepens, enveloping every page. As a stubborn idealist facing a determined government the unstoppable force that is the willingness of individuals to sacrifice themselves because of their principles against the immovable object of an imperial administration determined to enforce their authority. Hannigan’s account of a family desperately seeking to find a way to protect their imprisoned loved one is a heart rending one. The struggles of MacSwiney’s wife and sisters during the hunger strike is as dramatic and as powerful as MacSwiney’s own and while he was isolated somewhat from the public interest they faced the full weight of government propaganda and media attention. The actions of the authorities in his final hours and even after his death must have been hugely traumatic and are indeed quiet difficult to read. Not that this is a simple nationalistic take on the event. Seeking balance Hannigan reveals the thought and words of Lloyd George and other members of the British government the inability of those in power to comprehend MacSwiney’s willingness to die for his ideals and their incomprehension at the duration of the hunger strike itself. Hannigan reveals how the strike affected the wider public, describing professional and indeed caring doctors, trade unionist and ordinary citizens both in Britain and beyond and reveals how MacSwiney’s sacrifice both shocked and inspired people worldwide. This international dimension is striking and important it is an aspect that like MacSwiney’s own actions has largely been forgotten. As good a read as it is this book is not without flaws. The decision to write almost entirely about the hunger strike adds to the pace and energy of the book but robs the reader of background detail it would be interesting and perhaps important to note how important events in MacSwiney’s past (such as the actions of the Cork Volunteers during 1916) inspired his actions during those monumental weeks in 1920. The book is extremely emotional and at times the author himself sometimes gets caught up in that emotion leading to some mistakes. For instance he mentions Cathal Brugha as a ‘man later assassinated during the Civil War’. Brugha was in fact killed on 5 July 1922 during the Civil War, in the midst of the fighting in Dublin, having emerged from the Granville Hotel Dublin armed with two guns and refusing to surrender he was shot once in the leg and later died from this wound. And while he is correct that MacSwiney has become something of a forgotten figure this is true of many individuals in Irish history and was an inevitable result of the passions engendered by the Irish Civil War and a natural reaction to the troubles in Northern Ireland. Hannigan’s Terence MacSwiney, The Hunger Strike That Rocked An Empire is a compelling poignant page turner. It recalls an important event which as the author points out may have done more publicise Irelands struggle for independence internationally than any other episode during that period. As well as being one that was to have a huge influence on subsequent British government policy how much so is up for debate. But this is definitely a book that greatly adds to that discussion. Written by: william butler on 23 May, 2011. Last revised by: Eoinpurcell24 May, 2011. 2 Responses to "Book Review: Terence MacSwiney The Hunger Strike that Rocked an Empire"
Cathal Brugha was wounded umpteen time’s during the 1916 rising and I could not agree that it was a leg wound that caused his death. Billy, by 1922 he had recovered from those wounds and it has long been established that he was killed as a result of a shot to the leg (which severed an artery) in the fighting in Dublin in the civil war.